Hello everyone. Today I'm going to review a blush from Maybelline New York Color Show Blush range called Fresh Coral. This is also another product I received in my haul. I rarely apply blushes but when I'm getting ready for some special occasion, I definitely go for blush, bronzer and highlighter. This range of blushes is quite popular and budget-friendly. This particular colour is also a perfect pick for summer. I have already used a variant of this and here's my detailed review on Fresh Coral. Maybelline Color Show Blush is the new stellar blush on the block! The ultra smooth blush can be easily blended for a natural hue. A single application of the blush is good enough for a long-lasting tint. It is an extremely lightweight powder blush which will give you a fresh look minus the oiliness and shine! • The nonchalky texture makes the application process easy. • Highly pigmented hence one application is good enough for naturally glowy cheeks! • Available in 3 different shades. Concentrate the color on the apples of your cheeks and blend well. Apply the blush along your cheekbones for instant contours. Packaging: Maybelline Color Show Blush has a petite and cute packaging. It comes in a round black base with a transparent oval lid which shuts with a small click. The pan is good and the packaging is relatively travel-friendly and light weight. It is not extremely sturdy or comes with a mirror or brush as such but for the budget-friendly price tag, I would not complain much regarding it. Shade: The shade 'Fresh Coral' is a warm mix of pink and coral. The color has no shimmer or reflects at all. It looks slightly different in the hand swatch, but the actual color is in the pan. When I first swatched on the hand, it looked cool toned and I was not sure if it will suit my warm Indian skin but surprisingly, it turned out to be a gorgeous soft blush for summers. 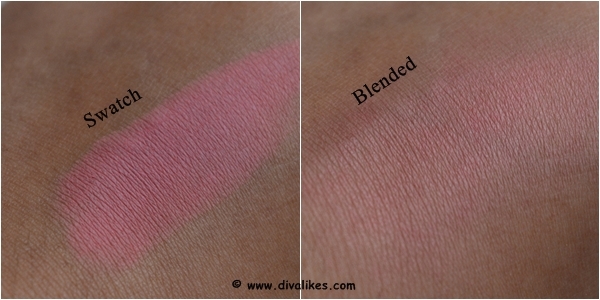 Pigmentation: Blushes are not meant to have crazy pigmentation. And this product has light to medium color pay off which is why any beginner can work with this. It never looks overpowering and can be easily toned down as per one's preference. It gives a very natural and soft look to the cheeks. Texture: The texture of the Maybelline Color Show Blush is soft, fine milled and smooth. It blends, nicely on the skin without being patchy or uneven. It gives a lovely soft matte finish and is a good pick for every skin tone. It looks natural and easy to work with in every sense. I, don't use blushes on a daily basis but whenever I work with it, I find it perfectly convenient. There are no powdery or chalkiness issues with the color at all. Staying Power: The staying power of the blush is around 4-5 hours in summers and the staying power is increased if I use a setting spray. It fades off evenly and leaves behind naturally flushed cheeks. Overall, the staying power is good for the price you pay. Nice, lightweight and travel-friendly packaging. Fresh Coral is a warm mix of pink and coral. Well pigmented but easy to work with. It will suit Indian skin tones well. The texture is smooth and easy to blend. It never looks patchy or chalky. It has a nice natural matte finish. Maybelline Color Show Blush Fresh Coral is a nice coral-pink shade for the summers and shows up pretty good on the skin. This is also a great option for beginners or if you are looking for a budget friendly blush for daily wear.